« Visit the Simon Pearce Flagship Store and Restaurant! 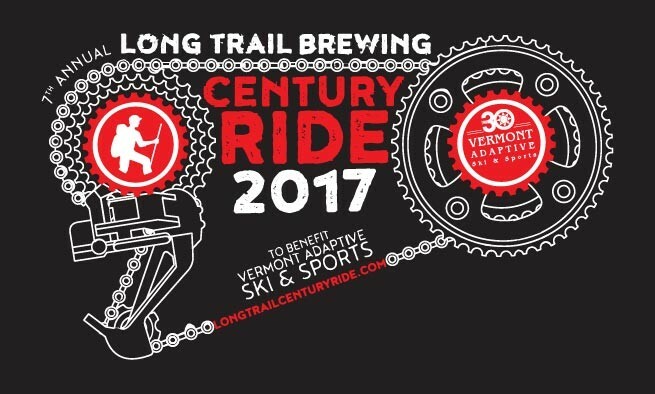 The Long Trail Century Ride is a recreational bike ride starting and ending at Long Trail Brewery in Bridgewater Corners, VT. Saturday, June 24th, 2017. The purpose of the annual ride is two-fold. First and foremost, getting out into the quiet beauty of Vermont as a celebration of the start of summer. The Vermont countryside, with its quaint barns, rolling hills, cow-specked fields, and covered bridges is so lovely this time of year. Getting out in it, first hand on a bicycle can be especially rewarding. The Long Trail Century Ride also raises funds for Vermont Adaptive Ski and Sports. In fact, one of the registration requirements is a minimum fundraising amount of $100. Vermont Adaptive Ski and Sports is Vermont’s largest nonprofit organization committed to providing sports and recreation to people with disabilities. Long Trail Century Ride’s goal is to raise $225,000 or more for this wonderful organization. Although “century ride” is in the title, the Long Trail Century Ride offers four different routes to suit almost any cyclist’s ability. Choose from a century ride, a 60-mile, a 20-mile, or a family-friendly and adaptive 5K. You can see the different Long Trail Century Ride course maps here. There is something for everyone to enjoy during the Long Trail Century Ride. All routes start and end at Long Trail Brewery – further incentive! In fact, celebrations bookend the Long Trail Century Ride experience! The event kicks off with a registration party on Friday and ends with Apres-Ride Party on Saturday. Pre-registration for the Long Trail Century Ride is available online. Registered riders will receive a Long Trail Century Ride wicking t-shirt, a Long Trail Pint Glass, and an entry ticket to the Apres-Ride Party. Riders whoregister BEFORE June 1st also receive a 2016-2017 lift ticket voucher to Killington Resort! So go ahead and come out for the 2017 Long Trail Century Ride! With food, drink, live entertainment, flowing beverages, silent auction, raffle, farmer’s market, and more, you don’t even have to ride a bike to enjoy yourself! Be sure to visit the Long Trail Century Ride website for follow the event on Facebook for updates, course info, directions, and more. Our Vermont B&B, Deer Brook Inn, is less than 5 minutes down the road from Long Trail Brewery! The 60 Mile course even goes right past our historic, 1820’s farmhouse inn. Deer Brook Inn’s convenient location makes us the perfect lodging no matter what it is you’re doing in the Woodstock VT area. Book your stay at Deer Brook Inn today!